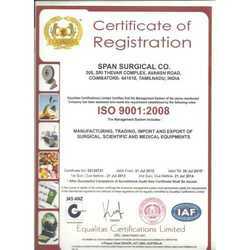 Established in the year 1994, we, “Span Surgical Co.”, are an ISO 9001:2008 certified firm engaged in importing, exporting, manufacturing and trading Autopsy Equipment, Weighing Scales, Mortuary Freezers and Embalming Machines. We are wholesaler & distributor of our product range. Our offered products comprises Autopsy Workstation, Autopsy Requisites, Forensic Weighing Scales, Autopsy Tables, Mortuary Freezers and others. Moreover, we offer Post Mortem Instrument, Body Bags, Autopsy Saw, Body Weighing Scale, Organ Weighing Scale, Embalming Workstation and others. The equipments are manufactured by us using high grade raw material that is procured from some of the most trusted vendors of the industry. Our range of surgical equipments are widely appreciated in the market for its extensive capabilities and outstanding output. Moreover, the entire range of products is fabricated adopting latest technology at our production unit. Our organization annually invests a considerable amount of time in smooth production processes, which helps us in meeting the urgent and bulk requirements of the customers. Besides, we have been strongly supported by a team of highly skilled professionals, who always support us to achieve success and organizational goals. Our mentor, 'Mr. Dhiraj Kalra' provides expert supervision and necessary guidance in the journey of our success. With his rich experience, motivational behavior and sharp business acumen, we have been able to acquire excellence in this domain. Manufacturing, Trading, Importer and Exporter of Medical Equipment. We are engaged in importing, exporting, manufacturing and trading a wide range of Autopsy Equipment, Weighing Scales, Mortuary Freezers and Embalming Machines. These products are highly used by the medical fraternity for forensic investigations and post mortem operations. Our precise and accurate instruments make clinical operations convenient and also facilitate a hygienic environment for post mortem procedures. The instruments supplied by us are all precision engineered and designed to provide maximum accuracy and efficiency. Our organization gives utmost importance in manufacturing of superior quality range of products. All the surgical instruments and equipments such as Autopsy Workstation, Autopsy Table, Autopsy Saw, Body Weighing Scale, Organ Weighing Scale, Embalming Machine, Portable Embalming Machine, Post Mortem Instrument and Body Bags are manufactured using quality assured raw materials to provide clients with optimum range of surgical products. Our products are thoroughly inspected and checked for flaws and deviations. Our instruments are complied as per the quality standards and norms. Our state of the art infrastructure facility is spread over a vast area of 500 sq ft. Our manufacturing unit is fully equipped with high tech machinery and advanced technology that enables us to fabricate a precision engineered range of Surgical Instruments and Autopsy Equipments. Our entire unit is closely monitored to prevent deviations in design ad other specifications. We also have CAD and CAM facility for providing accurate designs to instruments, which are then dispatched at the client's end. Our team of dexterous professionals at our unit are highly trained and hardworking in their respective domain, which is the prime reason for the success of our organization. The procuring agents associated with us select the most trusted vendors for procuring the range of products. Moreover, our production personnel manufacture the entire range of products, which can cater to the varied industrial requirements in the best possible manner. Our professionals comprise of engineers and medically qualified personnels who are trained to handle the complicated processes and are fully versed with the prevailing technologies. Our team is well trained to fabricate standard and custom configured surgical instruments which are in compliance with the medical and forensic fraternity upto strength. We can customize our instruments and equipments to cater to the requirements of multifarious users. Our instruments are all easy to handle and maintain and can be suited to functions in a forensic laboratory, an autopsy facility or a clinical research facility. It is our attention to detail that has made clients appreciate our products and has provided us with such an extensive clientele. We have CAD/CAM facility to facilitate in designing of instruments which are as per the clients requirements. We put in our best efforts to offer our customers a quality range of Autopsy Equipment, Weighing Scales, Mortuary Freezers and Embalming Machines in order to attain optimum level of client satisfaction. 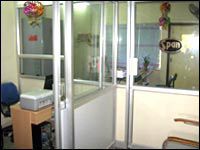 The equipments are made available to the clients in varied specifications to meet their demands. Moreover, we can customize the products as per the exact details specified by our patrons. Owing to our client-centric approach, we have been able to garner a vast clientele all across Australia, Indian Subcontinent, East Europe, East Asia, Central America, North Europe, Middle East, South East Asia and North America.